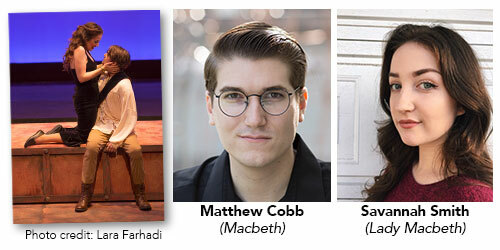 Congratulations to Golden West College actors Matthew Cobb (Macbeth) and Savannah Smith (Lady Macbeth) for being named nominees for the Kennedy Center/American College Theater Festival (ACTF) Irene Ryan Acting Scholarships for their performances in the recent Golden West College Theater Arts department production of MACBETH by William Shakespeare. Actors Matthew Cobb (Macbeth) and Savannah Smith (Lady Macbeth) are now eligible to attend the 2018 KCACTF Region VIII Festival to compete for an Irene Ryan acting scholarship. They can also proudly place the words “Irene Ryan Award” on their acting resumes. Upcoming productions for the Golden West College Theater Arts department include the classic The Glass Menagerie, the comedy The Little Dog Laughed and the award winning musical Evita. For more information on the Golden West College Theater Arts program, visit their website at www.gwctheater.com.